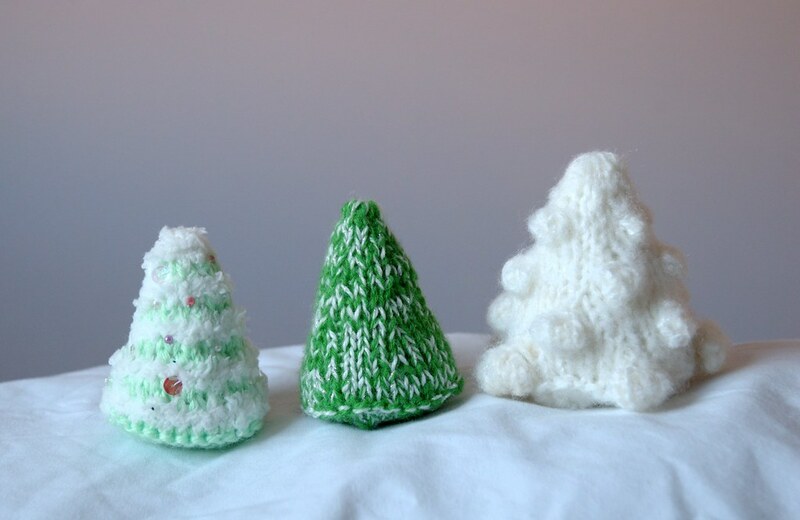 I thought I would share the pattern I made up for my little trees, because I'm sure all of you are caught up with your Christmas knitting and have time for one more project ;) These are a little tricky, but if you're comfortable with dpn's they're quite fun! 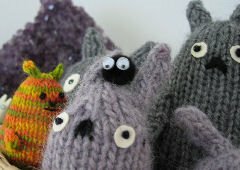 This project is great for using up little bits of yarn, especially that cheap acrylic stuff you wouldn't want to use for anything really nice. I used worsted yarn, but I'm sure the pattern would work fine with a different weight, and appropriate needles. Once the tree is done, you can decorate it with beads, buttons or sequins. Cast on 10 sts. Distribute between needles. Knit 2 rows. Purl 1 row. This makes the base of the tree. At this point, you will want to stuff what you have knit already. Don't stuff it too tightly, or the stuffing will show through the fabric and you will have trouble knitting the top of the tree. Add a bit of stuffing to the top of the tree. Break off yarn, thread end through remaining sts, pull tight and secure. Use the yarn end from where you cast on to thread though the loops of the cast on stitches, snug these together, then secure the yarn end. Ta da! A sweet little Christmas tree! m1 = make one stitch by picking up the loop between the stitch you just knit and the next one, and knitting into the back of this loop. If you feel creative, you can add stripes in different colours. The bobbles were a lot more complicated, but I can give you a basic idea of how I added them. There are 5 in each row, knit in the second of the 3 knit rows, like here*. The row at the bottom are 5 st bobbles, 5 sts apart. The next row are 3 st bobbles, 4 sts apart. The next row are 3 st bobbles, 3 sts apart. The last row are like little knots made by knitting into one st 3 times, then k3tog. These are 2 sts apart. You can stagger the rows of bobbles if you want, or just have lines running up the tree. December 13, 2007 at 7:40 a.m.
December 13, 2007 at 12:51 p.m. aarrghh!! I dont need more chrissie knitting to do!! 2 more of your toys are done and I have done 11 and finished (I gave up on 12, 1 child wouldnt appreciate it so he gets a book). December 13, 2007 at 11:27 p.m. I did consider not posting the tree pattern, considering how close it is to the holiday and how busy we probably all are. But they're so cute I just had to share! December 14, 2007 at 4:35 p.m.
December 14, 2007 at 8:35 p.m.
December 14, 2007 at 10:17 p.m.
thank you very much for the pattern! i am always looking for new ornament patterns and this one fits the bill quite nicely! December 20, 2007 at 7:57 p.m.
December 29, 2008 at 3:22 a.m.